Leaning on His Arms: Shocked, Confused, and in AWE of His Faithfulness! Shocked, Confused, and in AWE of His Faithfulness! WARNING: This story is one of answered prayers and miracles. If you are still waiting for your prayers to be answered and your heart is broken and still pleading for your own miracle, I completely understand if you want to stop reading now. Please come back here when you have your own miracle to share with me. Keep praying! He hears you! I'm praying for you too! It's been 8 days since I took that test and I'm still in shock and disbelief. But most of all, I'm in awe of His faithfulness. Just in case you haven't been following along, we had been trying to conceive our second child for about a year and a half when we finally saw a specialist and were diagnosed with unexplained secondary infertility. Since then, we had six IUIs with one resulting in an early loss. My impatient and longing heart was ready to move on to IVF, but at the suggestion of my doctor to try just a few more IUIs my husband and I agreed that we would give that a try. I was excited to take a break from even thinking about it for a month and just enjoy our vacation. Well, the vacation came and went. My work trip came and went. My brother-in-law moved in and his girlfriend was also here for two weeks. It's been a pretty crazy month. Since I had little idea about when I actually ovulated, I wasn't sure when to expect my period. At the very latest, I was expecting my period on October 26th. I had been spotting on and off for a week which, for me, is a sign that my period was coming. But the spotting was much lighter than usual and on the 26th, the spotting went away which never happens, so I finally caved and took a test. It was positive within a few seconds and I mean VERY positive! First, I laughed. Then, I asked God if this was for real? Then, I called my husband and hung up. I wanted to be excited when I told him, not confused and tentative. Then, I called my doctor, but they were out to lunch. Then, I called my BFF (who has been going through this EXACT same thing for EXACTLY the same amount of time) and we both laughed some more and freaked out and speculated about how this could have happened, then we praised Jesus! I was able to go get a blood test at my doctor's office within an hour, but wouldn't have the results until the next day. I was really trying to wait until I had those results to tell my husband, but I just couldn't wait. Husband: But how? I don't understand. Me: Yeah, I don't know and I don't get it either, but it's true. Husband: It's just SO weird! He came back and ask more questions throughout the day and proceeded to get more and more excited. It was fun to watch him process this news as I had done the day before. Then the nurse called with my lab results... 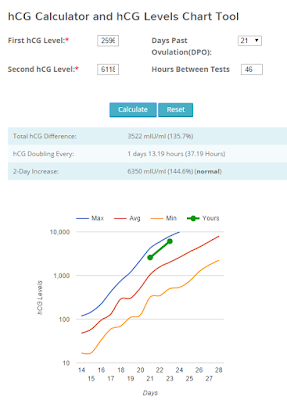 I was going to be thrilled with a HCG over 100 and a Progesterone level over 10 (was expecting it to be a little low because of the spotting that I had). Nurse: Nicole, congratulations, your HCG is 2,595. Me: What? Did you say TWO THOUSAND FIVE HUNDRED NINETY-FIVE? Nurse: Yes, and your progesterone is 49. Did you do an insemination this cycle? Nurse: Hmmm. Well, Nicole, you are very, very pregnant. 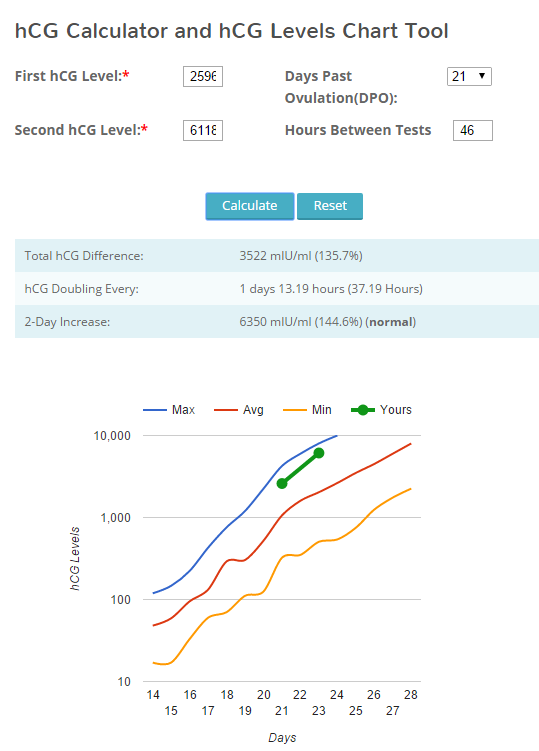 My HCG 48 hours later was 6,118. These numbers are very high for 4w4d and 4w6d, respectively. When I asked the nurse if there was anything to be worried about with such high numbers (I was slightly concerned about a molar pregnancy), she said "well, they are really high, which is typically an indicator of twins, but there are also plenty of pregnancies with high HCG, but only one baby. We just won't know until the ultrasound." My numbers are in green. Sky. High. My little girl has been praying for a brother AND a sister for months... could it be? Now, we anxiously await the ultrasound which is scheduled for Tuesday, November 10th. Praying that we see a sweet little heartbeat (or two?). I'm praying that I get to carry this little miracle (or miracles) for the full nine months, but even if it's only 9 days, I will rejoice in all the answered prayers. I will praise Him all of my days! At every bump in the road, He has strengthened me and filled me with the hope, love, joy, and patience that I needed to make it through cycle after cycle. I'm not saying that I never had doubts and moments of despair. There were plenty of times that I wasn't sure if I trusted Him. I don't deserve it and I'll never fully understand it, but thank you Jesus that you are faithful. Thank you that you keep your promises no matter how many times I fail to believe them. Thank you that you have answered so many of my prayers with this gift! And THANK YOU that you have used this season for my good and Your glory! I pray that if you are still in a season of infertility that you are filled with hope. Our God is able and He has a plan. Of course I feel joy about this gift I have received, but my heart still hurts for those wonderful mommies-to-be out there who are waiting so patiently for their time. If I already know your name, I'm praying for you by name. If I don't know you yet, I'm happy to pray for you by name if you contact me! I am struggling with secondary infertility and also with trust right now, which I cannot explain because I've been a faithful believer my entire life. Your story is nothing short of amazing and the grace you have displayed is inspiring. Congrats to you and your family! This is such an amazing blessing!!! Best wishes for a healthy and beautiful nine months ahead!! Glory to God. I tap into such amazing miracle. Thank you for sharing.